* The queen is RIGHT THERE! How hard can it be? This relative naivety–I prefer to think of it as “chemically reinforced optimism”–also extends to my experience in traveling this great land. Unlike the other Aleheads, who think nothing of hopping a jet (or jumping a freight train, if you’re Slouch) in order to go sample some new brews, I’m forced to live within my means as a humble scribe, firmly entrenched in the lowest possible position of authority in all dealings, both business and personal. It’s all the more important, then, that I take advantage of all opportunities to try new beer when they present themselves. This was certainly my philosophy as I embarked in August on my first-ever paid vacation as a working adult, spending 4 days in southern Wisconsin traveling from brewery to brewpub to beer bar. Along the way I hit staples like New Glarus Brewing, Capital Brewing, Tyranena and Lakefront Brewing, along with smaller brewpub gems like Madison’s Ale Asylum or the Milwaukee Ale House. I also made sure to stop and shop at local beer stores, which is where I ran into a few offerings from Furthermore Beer. I had briefly perused Furthermore’s pretty cool web site while planning my trip, and considered taking a jaunt to the west of Madison to visit their brewing facility in the small town of Spring Green, Wisconsin. I was discouraged, however, by a conversation with the brewer where he explained that they pretty much didn’t have a place to serve beer. So I made a note to keep my eyes open in Madison and picked up two interesting-looking Furthermore products: Three Feet Deep peat-smoked stout and Knot Stock, an APA with fresh-cracked black pepper. APPEARANCE: Burnt sienna into true black. HEAD: A finger of quickly dissipating tan-colored foam, little lacing. NOSE: With both beers from Furthermore it was quickly apparent that “a hint” must have some sort of alternate meaning in Wisconsin. Like, say, “a clenched fistful in your pint glass.” Which is to say, the peat-smoked malt comes through fairly strongly. Not much in the way of herbal hops to speak of, but it’s mostly the woody smell characteristic of smoked malt. TASTE: Once again a lot of peat, but in my opinion that’s actually a good thing in this beer. I like the way the slight smoked malt sourness and wood flavors meld with a solid dry stout–always a favorite style of mine–without much residual sweetness. I have a feeling I would enjoy the base beer as a good dry stout, but the smoked malt adds a secondary layer that is thoroughly enjoyable, and spicy flavors that are reminiscent of a rye whiskey-aged brew. Very light English hops on the back end. MOUTHFEEL: Fairly full-bodied, not particularly carbonated. DRINKABILITY: Dry stouts are some of my favorite session beers, and at 5.5%, I could definitely knock back a few of these and thoroughly enjoy the proceedings. It’s a tasty twist on a classic style. RATING: I waffled between 3 and 3.5 hops—I’m going with 3.5 hops for the win. Is it balanced? Not really. Is it delicious? Damn straight. Notes: 12 oz bottle, poured into 13 oz tulip glass. Style: American pale ale, with cracked black pepper. APPEARANCE: Orangey into light amber with some unappealing particulate floating around. HEAD: A finger of pillowy off-white foam that leaves sticky tattered lace in random patterns down the side of the glass. NOSE: Take the pepper shaker on your kitchen table, and get a few American pellet hops from your homebrewer friend. Remove the top of the shaker, stick the pellets in, shake it, and then stick your nose against the shaker. This is what Knot Stock smells like. The black pepper is out of control–extremely one-dimensional. The hops are trying to make themselves known, but mostly it’s just wave after wave of black pepper. TASTE: Unsurprisingly, what this tastes like is black pepper. There may be an okay, if bland APA under all the spicing, but you’d never know it, because all you can get is pepper, and it simply doesn’t work. The lack of a base beer that could stand up to the spicing really hurts this. The pepper flavor lingers for a very, very long time–a few minutes later I could still taste traces of pepper. It was like an omlette that I would make. MOUTHFEEL: Medium bodied, good level of carbonation, tingly from the pepper. DRINKABILITY: I’ve tried this beer a couple times, and I’ve never finished one. I just can’t keep drinking it. RATING: 1 hop. You know, I actually love black pepper–in food. It just didn’t work for me here. Checking on the beeradvocate ratings, I’m honestly amazed that it has an overall B rating–I don’t see how more people wouldn’t be overwhelmed by the black pepper in this. I’ve had other pepper beers that were decent, most recently Goose Island’s “Pepe Nero,” (which had very little pepper flavor) but there’s just very little that is redeeming here. Somewhere out there, I know that there’s a huge black pepper fan who will love this thing. I am not that person. Posted in Ale Factories, Tasting Notes.Tagged black pepper beer, furthermore beer, Irish dry stout, knot stock, peat-smoked beer, pepper beer, three feet deep. Interesting disparity between the two brews. 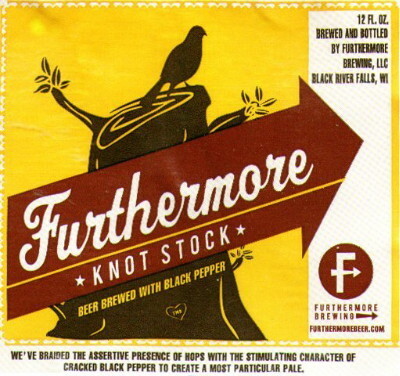 Seems like Furthermore is one of those breweries that loves their gimmick beers. Ale factories in that vein (see Dogfish Head, Mikkeller and BrewDog) vary wildly in terms of quality. Your post certainly supports that hypothesis. Still…color me intrigued. Nice post, Kid. I really do have a feeling that there are certain people who would trumpet the virtues of Knot Stock and its black pepper to the ends of the earth. Myself, I usually can’t get behind the unusual aesthetic ingrediants unless it makes the beer taste better. In the case of the peat-smoked dry stout, it does. In the case of the black pepper APA, it most certainly does not.